TORONTO - They called him "The Don,'' and with good reason. A larger-than-life character with a sharp wit who thrived in the spotlight, Don Matthews took wicked pleasure in keeping people around him on edge with his abrasive, no-nonsense style. The Hall of Famer, who died Wednesday at the age of 77, was one of the most prolific coaches in CFL history with 231 wins and 10 Grey Cups on his resume. But he was also a controversial figure who had a high-risk, high-reward philosophy. Players traditionally loved suiting up for him because of his reputation for creating a winning atmosphere and protecting his athletes. During the regular season, Matthews' teams rarely hit during practice and he routinely allowed his players to participate in creating the weekly game plan. Yet he maintained his distance. While known for being a "player's coach,'' he could also be ruthless when it came to making tough personnel decisions and he wasn't afraid to bench a veteran or cut him outright if he wasn't producing. "It's that balance and to do that you must be brilliant,'' said running back/slotback Mike (Pinball) Clemons, who won two Grey Cups over three seasons playing for Matthews in Toronto. "Some people try to be a player's coach but they let it go too far and the players run the roost. Matthews was also brutally honest, a trait reporters covering his teams knew well as he would call them out publicly for asking what he deemed to be an inappropriate question. But even the press corps respected him, voting Matthews the CFL's coach of the year five times. The Toronto Argonauts said he died Wednesday morning in Beaverton, Ore. He had announced in 2012 he was battling cancer. "Upon hearing of the passing of Don Matthews, the Canadian Football League family is both deeply saddened by this loss and grateful for his many contributions to our league,'' the statement said. Charismatic and brash with a sandpaper personality, Matthews was also a CFL winner from the beginning. The native of Amesbury, Mass., who eventually became a Canadian citizen, began his CFL coaching career as an assistant with the Edmonton Eskimos in 1977 before being promoted to defensive co-ordinator the following season. He helped the club win five straight Grey Cup titles from 1978 to '82 before being named the B.C. Lions head coach in 1983. 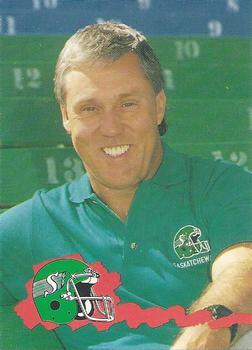 Matthews spent 22 seasons as a CFL head coach with B.C., Baltimore, Saskatchewan, Edmonton, Toronto and Montreal, reaching the Grey Cup nine times and winning a record five championships as a head coach. He was inducted into the Canadian Football Hall of Fame in 2011. "He was, quite frankly, the best leader I've ever been around,'' Clemons said. "He taught me so much and the majority of those lessons you didn't realize were lessons until after the experience when you realized you walked away with more than you gave, more than you were promised and much more than you were entitled to. And that included Clemons, who said Matthews allowed him to be a full-time running back for the first time in his career in 1996. That season, Clemons had more receiving yards (1,268) than rushing (286), which was a break from the football norm. "He changed his philosophy, he changed the game to accommodate my skill set in a time where that really didn't happen,'' Clemons said. Matthews' influence on Clemons continued when he served as Argos head coach from 2000 to 2007. "I think I was true enough to who I was, I didn't try to be him because you couldn't,'' Clemons said. "There was only one Don Matthews. More often, the public's view of Matthews was as a free-spirited straight shooter who was never lacking in self confidence. He was passionate about riding big motorcycles and launched a CD and video of the rallying chant "What Time is It?'' based on a speech he gave during the Montreal Alouettes' 2002 Grey Cup victory parade. But there were physical signs late in his career that time had caught up with Matthews. His face had become rounder and often appeared more flush. He was known to use a golf cart to get around during Alouettes practice, rather than walk. But Matthews was anything but boring. He was a master at moulding players to suit his systems. Routinely his defences were ranked at or near the top of most CFL categories, yet his players were well down in the individual statistical races. Matthews was never afraid to put it on the line in a big game and in 2003, he rode an attacking, blitzing Alouettes defence into the 2003 Grey Cup despite having rookies D.J. Johnson and Brandon Williams at cornerback. He stubbornly refused to change his philosophy in the CFL title game that year, choosing to blitz freely throughout and put Johnson and Williams in man coverage against more experienced receivers. The move backfired as Edmonton quarterback Ricky Ray continually victimized Johnson and Williams in leading the Eskimos to a 34-22 victory. Though he rarely showed it publicly, Matthews also had a softer side. When he was Argos head coach, he attended a book launch for Clemons. Matthews was holding Clemons' baby daughter Raven during the news conference when she began to squirm. To calm the little girl, Matthews removed one of her shoes and gently rubbed the bottom of her foot, settling her down immediately. "That's really what I think was unique about him, he was a man of all seasons,'' Clemons said. "Most of the time people don't do it and you discourage leaders to do that mostly because they can't. Straight shooter not lacking in confidence, sounds mighty familiar here at Sask. A 10-time Grey Cup Champ is put to rest. Best memories- During the 95 Grey Cup the Stallions were signing autographs a day before the game at The Field House in Regina for one hour. After waiting in line for the hour it seemed we were not going to make it in the time aloud. Time was up, and Don said to his guys okay wrap it up. Needless to say the remaining fans were devastated. A fan with a child shouted to Don" come on Don just a few more minutes." Don looked around and saw all the kids and parents with paper and pen in hand and he cracked the biggest smile ever and said to his team, okay guys just a few more minutes. Needless to say everyone got their autographs and left happy a half hour later. Thanks Don from the fan who shouted to you. RIP Coach. You will be missed. Great coach great human being. Somewhere Sinatra is singing I did it My Way - Mathews was the absolute greatest. Larger than life and NOBODY had more fun than this guy. Definitely a sad day. He will be missed. He was ours. As he said if you're not living on the edge you're taking up space. Words to live by.